A fellow named Wagner Hammerstrike is the quest giver. You can find him at the Gates of Ironforge (right where everyone duels) during the Harvest Festival. I was a level 58 Hunter when I picked this up. 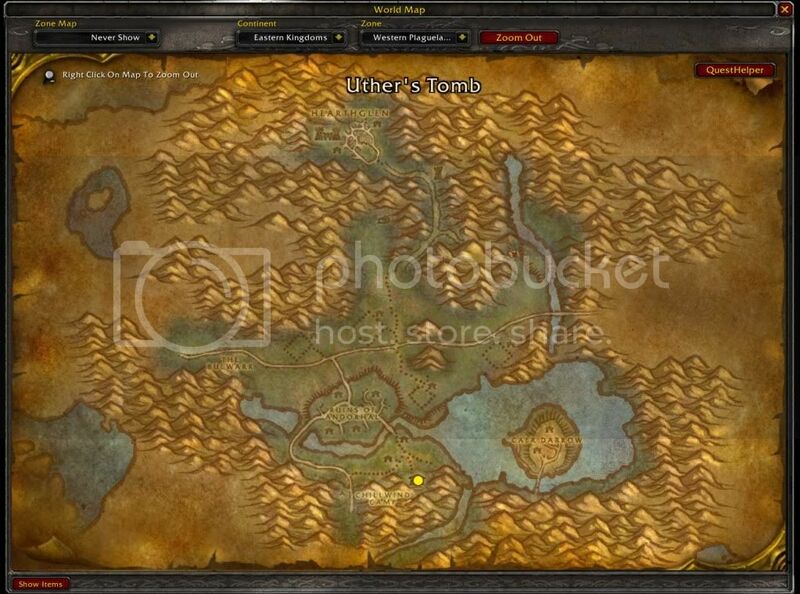 Uther's Tomb is at Western Plaguelands (52, 83). All you have to do is use Uther's Tribute in front of Uther's statue. You will probably notice the roses and steins in front of the statue which is what you leave behind for Uther from using the Tribute. I hearthed to Ironforge after I completed the objective and turned it in. I received an item named For the Light! which is a poem for Uther. Also 200 faction with Darnassus and Gnomeregan Exiles as well as 6600 XP. The quest was marked under the category of Seasonal. I did this quest at level 30 easily. It is easily doable at lower levels. From Southshore run north through Alterac. You may pass some Ogres, but at 30 you should be able to survive running through their area easily. Go north into the Western Plaguelands, you will not encounter any mobs on the way to the flight path. Grab the flight path and run east. You will come to a town of undead. Usually there are a lot of alliance farming here so hopefully they will keep the undead busy when you run to the tomb. If not use whatever evasion/immunity technique you have to make it to the tomb. If you die the graveyard is fortunately not far. Once you make the tribute hearth out and return to the quest giver for the book and a lot of XP. As of 24/09/2007 the quest seems to be bugged, I've taken and abandoned it three times (Flying back and forth) and nothing appears on the tomb nor i get the completion check. Be aware of it and wait for it to actually complete. Edit: I'm draenei , So yes this quest is not completable by our race. Re-tried on the following day. High suspition is that this quest does not work because i'm draenei. Quest is obtainable at level 30, not level 59. Confirmed by GM to be fixed for Blood Elves and Draenei in this week's maintenance. still bugged as of 12:05 AM EST on 9/26. Sorry. Us poor Blueberries and Fashion Models need to wait. It is not fixed yet. But not every GM knows about this issue. <GM> whispers: Greetings Nailer. I am Game Master Orazachi. Sorry to interrupt you during your game play. Do you have time to discuss your ticket in regards to your quest issue? To : Greetings, sure i have. <GM> whispers: Hello Nailer. To resolve this problem please exit from the game and delete the folder named Interface, WTF and Cahce from your World of Warcraft installation directory. Hey, i've done this quest, but i realized that the festival finished before i got back to them. Will i be able to hold onto this and turn it in, as soon as the festival comes back? Or will i have to redo it all over again? At level 48 I recieved 6300 xp and 500 rep with the Alliance. At 70, I got 7g59s and 500 rep with Alliance, along with For the Light! My level 33 night elf hunter got 2800 XP plus "For the Light." I rode from Menethil Harbor through the Arathi Highlands and Hillsbrad to Southport (to establish the flightpoint), then to Chillwind Camp (for another flight point), and finally over the hills to Uther's Tomb . In Chillwind Camp, I did group up with a lvl 50 druid who happened to be waiting for other members of his guild to show for a raid. Between us we handled the 2 undead that we encountered before the Tomb with no problem. From start to finish, the entire quest took less than 1 hour. I got 5500xp as a lvl 46 Warlock. This was a little dangerous but did get me to explore a place I hadn't gone yet and added a flight point notch to my belt. It did take me through what my friend described as the Death Field just north of Southshore. My Alliance lock made it to the river and followed that north. I turned in and got the book and a present in the mail. None of this is confirmed, it's just a little thought i got as I did the quest. Cute though, methinks. Enjoy the Harvest Festival, ladies and gentlemen. Actually, you're correct. If you check your combat log you can see yourself cast , which summons an object at your feet depending on which race you are. Of all the comments no one mentioned coordinates. this is the only quest for harvest festival? one quest for a week of honoring uther? non tomtom users - In Western Plaugelands, From Chillwind Point go north and Make the First Right Possible (on the road, very, very close to the Point you make this right, its a dirt road, not a main one) stick to that road untill you meet a fork in the road. Go south eastish... Where you see a building on your mini map and voila! your Uthers Tomb with extra Cheese, Nice and Hot! Just like you ordered. once you get there just walk up to his statue, use the item and voila! This quest counts toward 3000 Quests Completed. It does NOT count toward Loremaster of Eastern Kingdoms. I like the way your coordinates are for TomTom users only. I guess users of the more popular Cartographer, not to mention any other addons that display coordinates, don't get to use them? I just did this quest was hoping to increase my rep with Darnassus and Ironforge but my rep did not change at all, so it doesn't seem to be the case anymore that you get +500 rep with all alliance factions. I was confused when attempting to turn in this quest today. When I traveled back to Ironforge and Wagner Hammerschlag, he had no question mark above his head for me. When I talked to him, the quest name was shown next to a gray ?, as if I had not yet completed the quest objective. However, when I clicked the quest name, it took me to the completion dialog and I was able to complete the quest. Very odd. Don't be confused! Am I the only one who wants to do this version as an undead or blood elf? I can imagine even they would want to pay their respects, blood elves mostly since they weren't even blood elves or horde at the time of Uther's death. Undead are less likely to, but I can still see ones that were citizens of Lordaeron honoring a hero of their former people. Makes more sense than honoring an orc who butchered both humans of Lordaeron AND elves of Quel'thalas. It takes 30th level to receive this quest. The reward items are purely cosmetic, when you use it you become partially transparent for 1 hour with a shade of color of the item you used. The effect affects your mount/druid form too and doesn't persist through death. You can use Uther's Tribute at his statue anytime during the year, but you can only pick up and turn in the quest at the quest giver Wagner Hammerstrike during Harvest Festival. If you want to turn in the quest, but Harvest Festival has ended, you will have to wait untill next years Harvest Festival where it will be possible to turn it in, even if the quest was picked up during a former Harvest Festival. Wagner won't offer you the quest if you already completed the Horde version during the holiday. Instead he just sells your Alliance characters his selection of fireworks. Hail and well met! I completed the quest "Honoring a Hero", alliance. When I returned to Ironforge front gates, I found the ? on my map but no Hammerstrike to turn the quest into! I've tried logging out and then back into the game. I've even waited 24 hrs. Still no Hammerstrike. Is there a secret I don't know? Reist zu Uthers Grabmal in den Westlichen Pestländern und benutzt Uthers Tribut an seiner Statue. Kehrt zu Wagner Hammerschlag außerhalb von Eisenschmiede zurück, bevor das Erntedankfest endet. Während des Erntedankfests in Azeroth danken wir unseren Helden für all die Opfer, die sie in unserem Namen dargebracht haben. Für einige war es gar das höchste aller Opfer, ihr Leben. Die Allianz kennt viele Helden, doch keine Heldensage und kein Lebensweg ist so tragisch, wie der von Uther Lichtbringer. Helft uns Uther zu ehren, indem Ihr diese Opfergabe zu seinem Grabmal in den Westlichen Pestländern bringt. Legt sie an seiner Statue nieder und kehrt zu mir zurück. Lasst Euch nicht zu viel Zeit, denn ich bin nur bis zum Ende des Erntedankfests hier. Uther war selbst unter Helden ein Held. Ich vermag es mir kaum vorstellen, welche Qualen er erlitten hat, als Arthas, Uthers bester Schüler und von ihm geliebt wie seinen eigenen Sohn, Verrat an ihm und der ganzen Menschheit beging. Dennoch besaß er die Stärke sich zu erheben und zu versuchen, Arthas aufzuhalten. Für diese Selbstlosigkeit wird er uns immer als wahrer Paladin in Erinnerung bleiben. Er kämpfte bis zum bitteren Ende und dachte dabei nur an all diejenigen, die er retten würde. Habt Dank, <Name>. Heute habt Ihr einem großen Helden Tribut gezollt und so seinem Geist und dem Geist des Erntedankfests alle Ehre erwiesen.